At HNS we pride ourselves on our outstanding, highly motivated teachers who are committed to providing the best education to all students. Positive relationships between teachers and pupils builds on the high quality of the teaching and a central focus on discipline, respect and responsibility. Teaching is in mixed ability groups, with a focus on personalised learning and regular assessment in order that each student is appropriately supported and challenged. The rest of the team at HNS ensure that the students and teachers are fully supported in all aspects of the school day. Our pastoral managers, learning support assistants, technical staff, office and finance team, alongside our mentors and volunteers, are essential to the smooth running of the extended day and all join teachers and students during our family style dining at lunchtime. Hackney New School is a secondary school with a focus on music. We opened in September 2013 with four Year 7 classes of 25 pupils each and we are now at full capacity with 500 students. 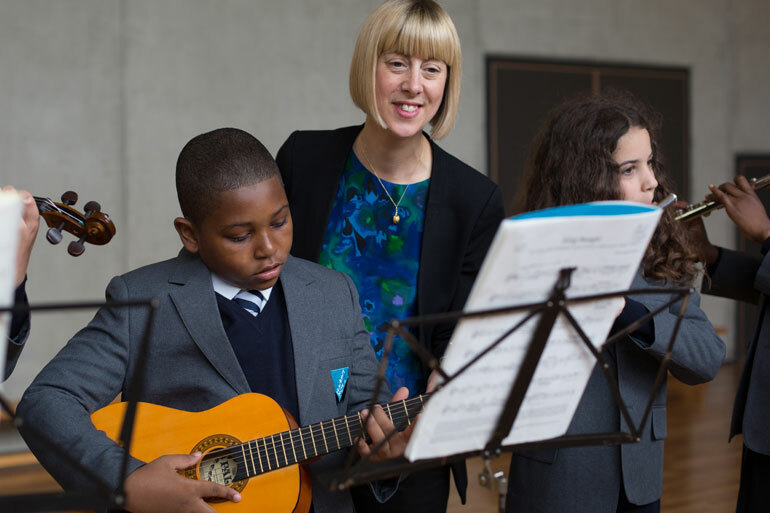 Hackney New School’s curriculum focuses on the core subjects of the English Baccalaureate and Music with additional options such as a further Modern Foreign Language, providing all our students with the opportunity to take at least ten GCSEs and five A/AS levels. Our emphasis is to provide our students with an outstanding education, to teach them to think independently and develop a sense of responsibility for the society in which we live. Hackney New School has an innovative ‘extended day’ with opening hours from 7.30am (with an optional breakfast club) until 5/5:30pm, with time for private study alongside lessons. Our timetable has been designed to offer students the very best mix of class lessons, supervised private study, group work and co-curricular activities to deliver a truly inspiring and enriching education.